WASHINGTON (CNN) -- President Bush's budget chief blamed the faltering economy and the bipartisan stimulus package for the record $482 billion deficit the White House predicted for the 2009 budget year. 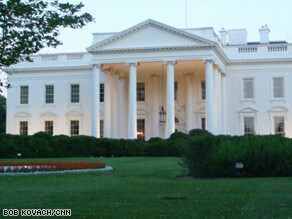 The White House blames a faltering economy and the stimulus package for the increased budget deficit. Jim Nussle, the director of the Office of Management and Budget, said the deficit would be about 3.3 percent of the nation's gross domestic product, the measure of the nation's total economy. White House spokeswoman Dana Perino said the stimulus package was necessary, even if it increased the deficit. "We do think the plan was the right one, and it will have an effect," she said. "And the best way to help reduce the deficit is to make sure you are keeping a lock on spending, but also that you can also try to help to build the economy. So we hope this will help us pull out of the economic downturn over the next few months because of the stimulus package. "I remember that back when we were discussing the stimulus package, both parties recognized that the deficit would increase, and that would be the price that we pay in order to help improve the economy," she said. "The determination was made that getting the economy back on track was a higher priority than immediate deficit reduction," Nussle said. He said the OMB projects that the deficit would fall after the 2009 budget year, and he predicted that the government would have a surplus in budget year 2012, if the president's budget blueprint is followed. "Near-term deficits are temporary and manageable if -- and only if -- we keep spending in check, the tax burden low and the economy growing," Nussle said, warning that congressional Democrats were planning to add billions of dollars in spending to the federal budget. The Bush administration has spent heavily on the wars in Iraq and Afghanistan, and faces a large budget shortfall in tax revenue in part because of Bush's tax cuts and a souring economy. Conrad, who chairs the Senate's budget committee, accused the president of "squandering" the surplus he inherited from President Bill Clinton and said the increased debt the government has taken on to cover the deficit has undermined the value of the dollar and hurt the overall economy. "If they gave out Olympic medals for fiscal irresponsibility, President Bush would take the gold, silver and bronze," Conrad said. "With his eight years in office, he will have had the five highest deficits ever recorded. And the highest of those deficits is now projected to come in 2009, as he leaves office." But a senior administration official says the budgetary problems stem from what he called inadequate defense, intelligence and homeland security resources that were handed down from Clinton. The nonpartisan Congressional Budget Office in March projected the deficit for the 2008 fiscal year, which ends September 30, would be $357 billion. It predicted the 2009 deficit to be $342 billion, if the president's proposals were adopted. Both assumptions, however, were made before the economic stimulus package was passed by Congress and signed by the president this spring. The CBO said it would release revised deficit estimates in September. The two major presidential candidates -- Democrat Sen. Barack Obama and Republican Sen. John McCain -- used news that the United States' budget deficit will hit a record high as an opportunity to criticize each other's fiscal plans. CNN's Brianna Keiler and Scott Anderson contributed to this report.